This has to be one of the most unusual pieces I have come across. It is an old wooden machine for twisting the rope cords during rope making. 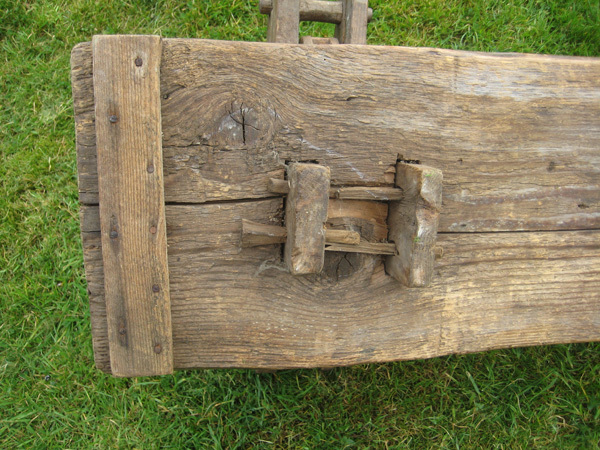 I have tried to do some research into this and it appears that it would have been made by a village carpenter for use in, possibly, a fishing village to make ropes for the local fishermen. 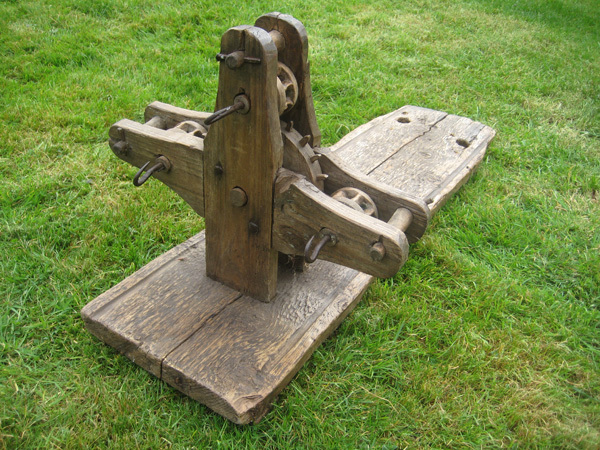 It would not have been used for the mass manufacture of rope as it is not robust enough for that, but was intended for occasional use as and when ropes were required by the community. Made by an artisan carpenter it is almost a work of art with the wooden cogs and wrought iron fittings. I love the handle which is made from a single branch and side shoot held in position by a wedge and wrought iron strap, absolutely right for the purpose. 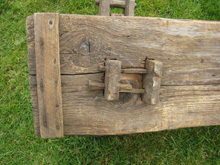 The base may have been reused from an older plank as I cannot see the purpose of the grooves, also it has been cut to the present length from a longer piece of wood. Approx overall sizes, width 430mm, length 1000mm, height 450mm. I have been told a variety of ages, from early 18th century to early 20th century. It could originate from a British village, possibly in Cornwall or it could be from elsewhere in Northern Europe. Overall it is in pretty good condition. 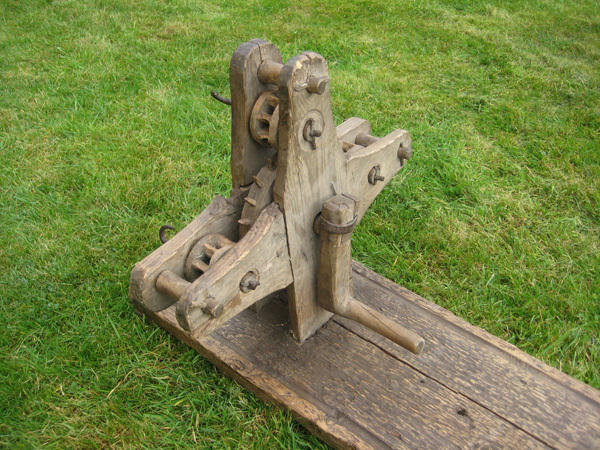 Obviously fairly worn from use and there are a couple of holes where it looks like it has been hung on a wall. If you are looking for a very unusual piece as a feature in a pub or restaurant or as a museum display item this is it. Let me know if you would like more details or photos. Likewise if anyone can give me more information I would love to hear from them. The size makes it impractical to post and so buyer collection would be best. Courier delivery could be arranged or I will meet the buyer within a 50 mile radius of Leicester, costs to be agreed. Price £280.00, Delivery or collection to be agreed.